We were simply devastated to hear of the untimely death of Peter „Sleazy“ Christopherson on 24th November 2010. May he continue to beam in the spheres beyond this place! Peter Christopherson created a body of work that was hugely influential and inspirational to aufabwegen. Not so much his work as part of TG but his group COIL, which was one of the most moving and exciting musical projects ever. I had the pleasure of meeting Sleazy a couple of times and one of the most remarkable events was being invited to COIL’s house in London in late 1994 and doing an interview with Geff and Sleazy for my magazine aufabwegen. Sleazy would be leaning with his back against the wall and mostly be smiling and listening to what Geff was saying about COIL. From time to time he would make a funny remark or clearing up something that needed a factual input. After that we met a few times around COIL concerts or when I had the pleasure to interview TG for their reunion. In 2009 I was fortunate enough to host a concert by Sleazy’s project SOISONG in Cologne – he was funny, in good mood and seemed very happy about his new life in Bangkok. He was talking about his new love for ZEN things and how he was going to take up meditation seriously and generally he seenmed full of plans and energy. It is hard to believe that he passed away so suddenly and out of the blue. Our thoughts are with the people near to him and his family. We are thankful for having met such a wonderful and inspiring artist and thanks Sleaze for all he has given us. May he dwell the fields beyond our horizons with his typical smile upon his face. 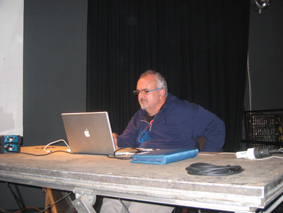 The picture below shows Sleazy during soundcheck in November 2009 for the SOISONG show in Cologne.